Nothing tastes or smells quite as good as homemade bread, and it's much easier to make than you might think. Basic bread is made from just three simple ingredients - flour, yeast and salt. The better the quality of the flour, the better the finished loaf. Waitrose very strong Canadian white flour, for instance, has a wonderful creamy colour and silky texture that results in a lovely smooth, stretchy dough. 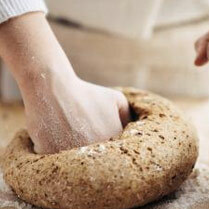 Its high gluten content gives the dough its elasticity and therefore makes a lighter finished loaf. For a simple white loaf, all you need to add is a sachet of fast-acting yeast, a little salt and some lukewarm water to make a dough. And don't be put off by the idea of kneading the dough: kneading is necessary to get a good, evenly risen loaf - and working the dough is a therapeutic task.